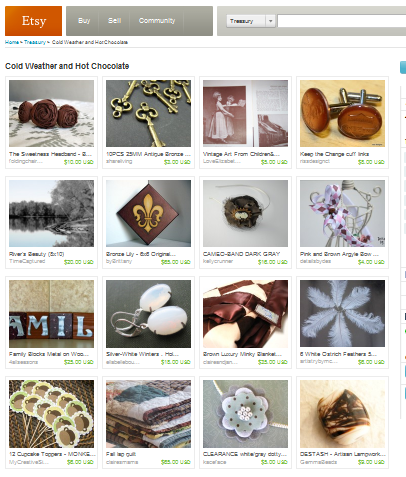 I made a treasury today, featuring many teammates from the LDS Members of Etsy Team, of which I'm a member! They represent my love of changing seasons and the excitement that comes as each new season approaches. I'm thinking of cold winter mornings where you don't want to walk on the tile in the bathroom because the shivers are unbearable! Then I think of running to my kitchen, bundled in a blanket, and warming up some water for hot cocoa. Yum! I think it's so fun at this time of year to pull out my cold-weather clothing; coats, gloves, hats, scarves, and sweaters. I also love piling up the blankets and snuggling with my hubby and baby. What great times to make great memories!